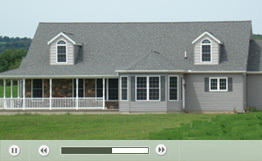 F&N Homes can build you a modular home in any color. No matter what color you choose for the exterior of your home, consider making your new custom modular home green – inside and out. The goal of green building is to protect the environment and conserve energy and natural resources. F&N Homes can help you build an affordable custom green home that is designed to be energy efficient, reduce water consumption and promote the health and well being of the home owner. Green construction can incorporate all of the custom design features that make modular building so popular. Prefabricated construction is green by its very nature, limiting the impact to the environment. There is minimal disturbance to the building site from stored materials and heavy equipment. Modular construction produces far less waste. Pre-built components, such as trusses and pre-hung doors, allow a more efficient use of raw materials. Many construction materials are sustainable and can be recycled. Building materials are not exposed to the elements, reducing the likelihood of mold and mildew damage, which results in improved indoor air quality and a healthier home. Energy efficiency is the hallmark of green construction. Green building benefits you and the environment. Modular construction is extremely energy efficient, which not only makes your home eco friendly, but substantially reduces your energy costs. The increased energy efficiency is a result of the modular building process. Each module is precision manufactured to exact specifications, resulting in components that fit together perfectly, creating a nearly air tight seal to prevent energy loss. Green is more affordable than you might think. You can reduce your energy usage and costs substantially by adding just a few energy saving features to your home. Send F&N Homes a message or call us at 570-753-2440 to set up an appointment. F&N Homes is licensed by the Commonwealth of Pennsylvania (PA034466). F&N Homes has been designated as a “Distinguished Builder” by several premium modular home manufacturers and is a member of the Pennsylvania Builders Association and the Central Susquehanna Valley Builders Association.